Do you want to visit Sydney, but you’re afraid that this trip will cost you an arm and a leg? If you do, your fears are completely rational since Sydney is an expensive vacation destination. 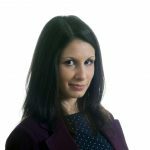 However, we have prepared some practical suggestions for you on how not to go bankrupt and still have the time of your life in this amazing city. Since the accommodation is one of the biggest expenses, it’s important to choose it wisely. If you’re planning to spend most of your time in the central part of the city, it is preferable to choose a hostel there instead of wasting your time in public transport. Nomads Westend Hostel is located in the centre, with a rich offer ranging from private rooms to a 32 bed dorm. On the other hand, if you want to spend your vacation on a beautiful beach, our recommendation is the Bondi Beach. Here you can find an affordable hostel which will be a stone’s throw from the sea. However, another great option to avoid paying too much for the accommodation is to find friendly flatmates in Australia, who can also help you discover some inexpensive, but beautiful tourist attractions. You should be careful when choosing a place to eat, because Sydney’s restaurants can be extremely costly. Fortunately, there are also many affordable places in which you can savour inexpensive and delicious hamburgers, fries, sushi, fish and chips, etc. 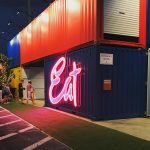 El Jannah and Guzman y Gomez are one of such places which we strongly recommend. However, even if you’re a vegetarian, it doesn’t mean you will have to spend a fortune on food. Duy Linh is the place for you. Two persons can have a hearty meal here for less than $40. It’s very important to consider the transportation options wherever you go, and especially if your destination is a metropolis like Sydney. Firstly, you can find some free tours around the city where you’re expected to just leave a tip, which is nothing compared to how much these tours can cost. Secondly, biking around Sydney is another great option. 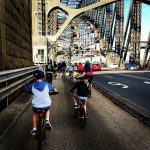 You can either choose one of the amazing city tours like the Sydney Harbour Bridge bicycle tour or consult other experienced cyclists and make up your own route. No matter what you opt for, make sure to pack your Pearl Izumi equipment in your suitcase and truly enjoy the ride. Finally, it’s highly recommendable to have an OPAL Card, a smartcard ticket for public transport. However, if you need to travel a longer distance by train, it is better to go during off-peak hours because of the significant discounts. There’s no better and cheaper way to get the panoramic view of the Sydney’s centre than by ferry. You can cruise by the landmarks of the city, the Harbour Bridge and Opera House, enjoying the amazing view for less than $10. 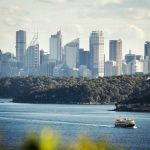 Other free attractions worth visiting are The Rocks, an urban locality, tourist precinct and historic area of Sydney’s city centre, and the Royal Botanic Garden. In the garden, you can see a variety of Australian plants and spend an enjoyable afternoon in the nature with your friends. The Chinese Garden of Friendship is another must-visit location which is filled with bamboo plants and glistening waterfalls. It offers an insight into Chinese culture and the most interesting places to visit here are the Dragon Wall, the Water Pavilion of Lotus Fragrance, the Twin Pavilion and The Tea House that offers traditional Chinese tea. You can get all this for only $6 per person. However, if the whole family comes, the admission fee is only $15 in total. Sydney is famous for its sandy beaches such as the Bondi Beach, Tamarama Beach, Coogee Beach, etc. You don’t need to spend much to be able to relax on some of them, while soaking up the sun and swimming in the ocean. However, you can also go on the Bondi to Coogee coastal walk and get to enjoy the dreamy view for free. Aside from that, you should visit the Festival of the Winds. 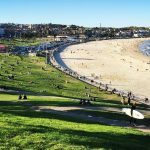 It’s the largest kite flying festival in Australia organised every year at the Bondi Beach and the best thing is that you can also join it and fly your own kite. Another free tourist attraction is the largest annual outdoor exhibition, the Sculptures by the Sea. There’s a 2km long sculpture park with more than 100 sculptures made by the artists from Australia and across the world and it attracts hundreds of thousands of tourists every day. As you can see, visiting Sydney will not necessarily drain your bank account. On the contrary, it will enrich your life with new experiences and some unforgettable memories.